Sunday morning was a great day for a run, not for me but for 13,000 runners in the Chevron Houston Marathon and 12,000 runners in the Aramco Houston Half Marathon. Yes, interestingly, these foot races are sponsored by oil companies. On her way to church with our kids, my wife got stuck in traffic but took advantage of that to watch the runners for a few minutes. She took this amazing photograph not too far from our neighborhood. 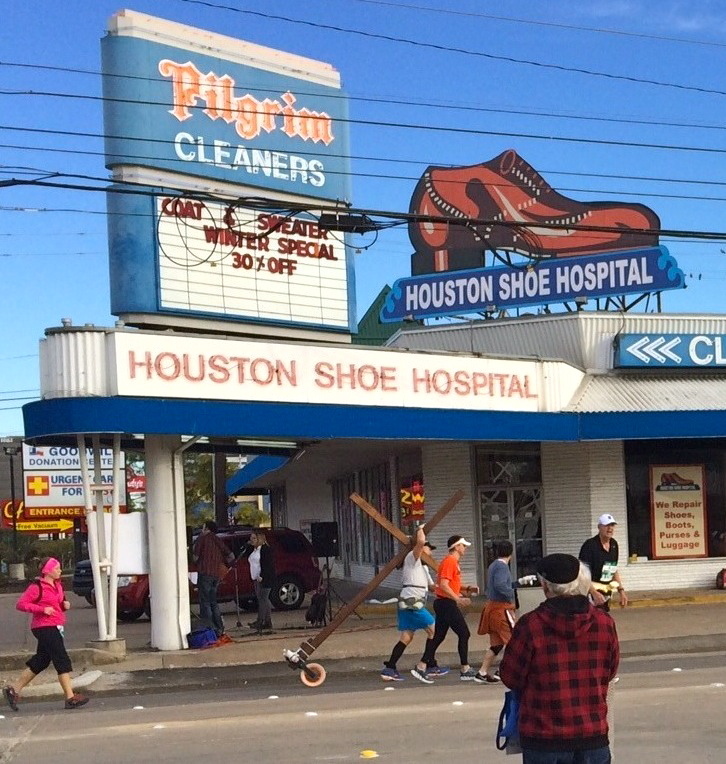 Needless to say, there’s a lot going on here — The Shoe Hospital, Pilgrim Cleaners, Goodwill and Urgent Care in the background, live music under the sign to serenade the runners, and, yes, someone carrying wheeling a cross on the marathon route. “All God’s children got travelin’ shoes,” I suppose.